Brimar Curtain Rods Shop and buy Brimar Curtain Rods and drapery hardware in gorgeous ornamentation most windows can't do without. 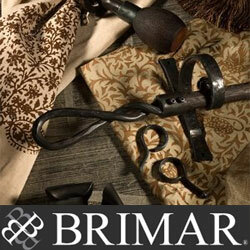 Brimar's wide range of curtain rods and hardware offers decorative and functional features in a spectrum of styles, materials and fashion-forward finishes. Consider Brimar Curtain Rods sleek stainless steel finials, curtain rings and rods for a contemporary style or a more traditional look with beautiful hand carved wood finials, poles and brackets. Casa Valentina Curtain Rods Tradition, passion, fantasy and new shapes is what Casa Valentina curtain rods is all about. 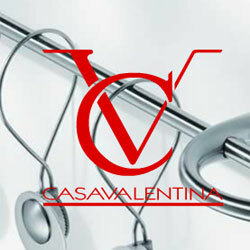 Casa Valentina Curtain Rods is an Italian company that offers exquiste and unique design styles in it's drapery and curtain rods that includes coordinating cutting edge hardware. 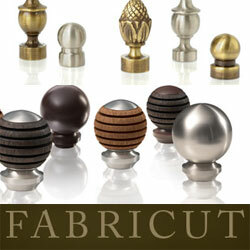 Fabricut Curtain Rods and Hardware Shop from curtain rods featuring an assortment of materials, scales and finishes, Fabricut Curtain Rods and Drapery Hardware showcase classic traditional designs along with innovative modern styles for the budget minded decorator. Choose from pole diameters from a small 1/2" up to a beefier 2" curtain rod. Buy from the mix of finials offered in these Fabricut curtain rod offerings that are great for those wanting elegant looks to finish off their window treatments. 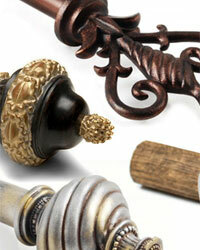 Finestra Curtain Rods Finestra Curtain Rods are designed to ship quickly while providing a custom finish. Choose from the 25 designer colors that are offered in this large selection of affordably priced curtain rods which offers wood poles in 1 3/8", 2" and 3" diameters. Lengths of 4, 6, 8 and 12 feet are offered along with a splice for adjoining two poles for extra large windows. Created and finished in the USA the designs in the finials are hand carved from wood and then made into a mold which is used to form the wood resin finials. All of the Finestra curtain rods and hardware are hand finished; therefore, the finish will differ slightly from rod to rod and bracket to bracket. The rods and poles as well as standard and decorative curtain rings and brackets are made out of wood. The Finestra curtain rods wood curtain rod collection is primarily traditional, but some of the simpler finials work great with modern decor. For a tropical look an affordable line of bamboo curtain rods in 1 3/8", 2" and a large 3" diameter with complementing bamboo curtain rings that are available individually or bulk packed. The Finestra curtain rods also offers a variety of bracket styles which include inside brackets, adjustable swivel brackets to accommodate bay windows and windows of every angle, as well as solid elbow brackets for going around inside and outside corners. Graber Curtain Rods Shop Graber Curtain Rods, a leading brand of Springs Window Fashions, built on a 80 year foundation of quality and reliability that is known throughout the industry. Since 1939, Graber Curtain Rods has been giving customers like you, high quality designer window treatments in all the latest styles and colors. 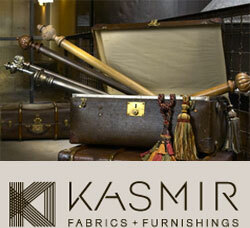 Kasmir Curtain Rods An elegant exclamation! In Kasmir Curtain Rods the perfection of form meets function with the addition of decorative finials, poles, tiebacks, rings and brackets. Shop Kasmir Drapery Rods entire offering of curtain rods that will add a beautiful finishing touch to any window treatment in your home where you want gorgeous looking drapery or curtains. 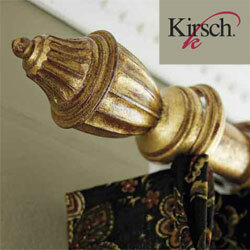 Kirsch Curtain Rods Kirsch Curtain Rods have a reputation for good looks and high quality at budget prices when you are looking curtain rods, finials, rings, brackets and coordinating hardware to complete the look of your window coverings. Kirsch curtain rods are some of the strongest and most versatile rods on the decorating market today and are offered here at discount prices to help you complete the look of your curtains and drapery. Menagerie Curtain Rods Menagerie Curtain Rods are dedicated to creating decorative window treatment curtain and drapery hardware that is both unique and fashionable. 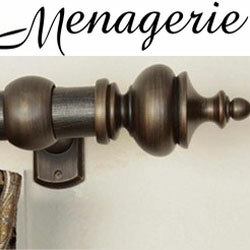 Menagerie offers access to the latest drapery and curtain rod products that feature innovative designs and helpful information. When you have Menagerie Curtain Rods available why look anywhere else? Novel Curtain Rods and Hardware Novel Curtain Rods and drapery hardware offers a wide variety of decorative traditional to sleek modern curtain rods, finials, mounting brackets, curtain rings, tiebacks and more to give your window treatments that special look. 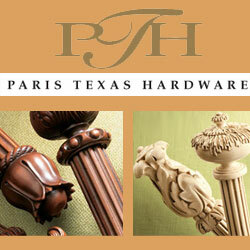 Paris Texas Hardware With a dedication to exceptional design and superior service, Paris Texas Hardware will provide a unique, elegant and high quality selection of decorative drapery hardware. These creative curtain rods are unrivaled in their ability to stand alone as beautiful and durable as well as being functional. Robert Allen Curtain Rods Shop and buy from Robert Allen Curtain Rods in stock program that offers home owners and designers, thoughtfully conceptualized curtain rods grouped by lifestyle. Whether it be modern and contemporary or traditional this offering of Robert Allen drapery rods and Robert Allen curtain rods and hardware is sure to please even the most sophisticated decorator. Shop from a wide assortment of drapery rod styles ranges from the rustically elegant Toscana, to the tropically romantic Polynesian along with a range of other great looks. Stout Drapery Hardware New for 2017, Stout Drapery Hardware brings a streamlined selection of metal and wooden curtain rods for your decorating projects. Stout curtain rods feature metal rods with heavy duty construction to span longer distances available in a petite .5", a standard 1" and a stately 1.5" diameter. 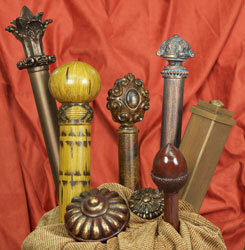 Stout Drapery Hardware also features gorgeous Natural Beauty 2" wood rods include traversing options. 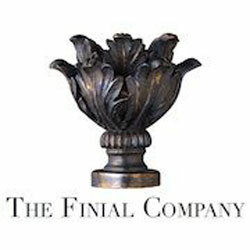 The Finial Company Shop online for The Finial Company Curtain Rods and you will find some of the finest drapery hardware in an offering of 319 different finial choices to glorious brackets coupled with twisted metal poles, curtain rings, swivel accessories for inside bow windows along with bay windows to outside corners. 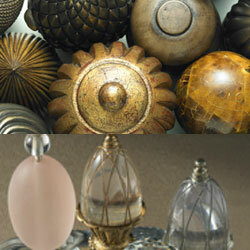 This great group drapery hardware includes end finials along with rosettes and other accessories await you. Choose from drapery track in the standard corded systems to 25 different motorized systems with all the finest finials and drapery hardware available. Trend Curtain Rods From classic styles to new innovative, contemporary designs, Trend Curtain Rods offer quality drapery hardware for the budget minded decorator. 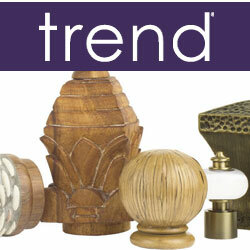 Trend Curtain Rods offers top quality components that are easy to install and have fantastic great looks. 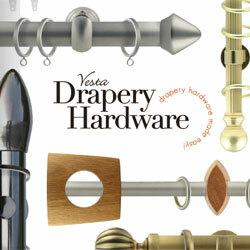 Vesta Drapery Hardware Shop Vesta Drapery Hardware featuring the hottest design trends from around the globe. 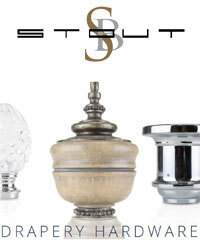 Vesta curtain rods and Vesta drapery rods offer the latest in technology and design. With several modern track systems and versatile styles, you are sure to find the perfect curtain rod for your home when choosing Vesta Drapery Hardware.